Does the management have a vision for the future that is grounded in the product/service offered by the company? As noted in part 1 of this series, the revenues of a young, growth company are bounded by the potential market for its products and services. A management that defines its business too narrowly is limiting its growth potential and by extension, its value. If a management defines its business to broadly, the vision becomes unrealistic and thus not credible. In a sense, management needs to have a vision that is both large and grounded in reality at the same time... Not easy to do, but why is that a surprise? If it were easy, we would all be founder/CEOs of our own businesses! Is there an operating plan to bring this vision to fruition? As businesses have found through the ages, a soaring vision and/or a great product is just the first step. Without the grunt work of operations (production, marketing and distribution), commercial success will remain elusive. Since relatively few visionaries have the patience or aptitude for the "nuts and bolts" of operations, this will require having the right people in place and the willingness to delegate power to these people. Is there clarity on the trade offs that the firm faces for the future? It is true that the founders of young, growth companies have to sell investors on their potential for success. Many founders, though, view this mission as requiring them to sounds relentlessly optimistic and highlighting only the positives. However, the most persuasive pitches are made by founders who are open about the trade offs involved in success and the risks they face, and are willing to outline how they plan to make their choices. Thus, a CEO who talks about growth potential without mentioning how much she needs to spend to deliver this growth (and how she plans to finance it) and/or the competition she will face is less credible than one that talks about growth and then goes on to discuss how the company plans to deliver this growth and what it will cost. Is there flexibility built into the plan? No matter how well thought out a concept may be, young, growth firms will be buffeted by unexpected occurrences, some bad and some good: that is the essence of risk. One key test of managers in young, growth companies is whether they have contingency plans for "bad" events. It may be mark of a brave soul to embark on a mission with no second thoughts or escape hatches, but for young businesses, that could be suicidal. Just as critical a test is how well managers have prepared for success, since success will bring with it different types of tests: new competitors, financing needs and staffing requirements. In fact, you will learn a great deal about a company, when you see it navigate through its first few crises and opportunities. Are managers willing to trust you (as investors) with news (especially bad news)? Are managers willing to trust you (as investors) with the power to challenge them? 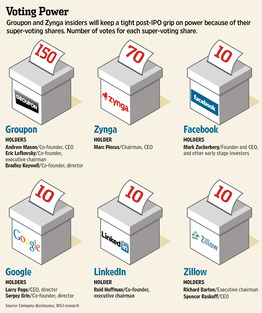 By giving the founders/insiders 150 voting rights per share, Groupon effectively is issuing common shares with no voting rights. They are telling me that they want my money but not my input on how the company is run. That is their prerogative but I will exercise mine and not play this one sided game. If you are interested in investing a young, growth company, pick up a filing for a prospective IPO or the annual report for a and review it. Make your best judgment on whether the management sounds credible, truthful and is worth trusting.. and also look for the clues on whether they trust you back. And keep updating your views, based on how the company responds to events. Manage its existing capital (assets) more efficiently: Thus, if the firm can cut its operating expenses and increase its income to $12 million next period, it will have a growth rate of 20% for the next period. Let's call this efficiency growth. Add to its capital base: If the firm can add another $ 10 million to its capital base and maintain its current return on capital (10%), its income next period will be $ 11 million, with a growth rate of 10% over the prior year. Let's call this "new investment" growth. Time: A firm can cut costs and make itself more efficient over time but only to the extent that these inefficiencies exist. Thus, a firm that is badly managed may be able to generate efficiency growth for 3, 4 or maybe even 5 years, but not forever. New investment growth is called sustainable growth because it can be continued for as long as the firm can maintain its policy on reinvestment and the return it generates on its investment. Value: Efficiency growth always creates value, since no investments are needed and earnings and cash flows will go up. Whether new investment growth creates value revolves around whether the higher earnings created are justified by the additional investment that is required to generate them. Since it costs companies to raise capital (the cost of equity for equity and the cost of debt for borrowed money), the return generated on that capital has to exceed the cost of capital for growth to add value. In the example above, introducing a cost of capital of 10% into the analysis will make the new investment growth "worthless", since what is added in value through the higher growth will be exactly offset by the higher reinvestment (and lower cash flows) needed to generate that growth. As an exercise, you can try entering different combinations of growth, return on capital and reinvestment and measure the value effect in this spreadsheet. This calculation is also in the spreadsheet referenced in the last paragraph. It is the only place in valuation/corporate finance, where we use book value and we do so because we are looking at the profits generated on what was originally invested in existing assets (rather than their updated market values). There are a host of dangers associated with trusting accounting numbers and I have written about them and what to do to compensate in a paper on measuring returns. 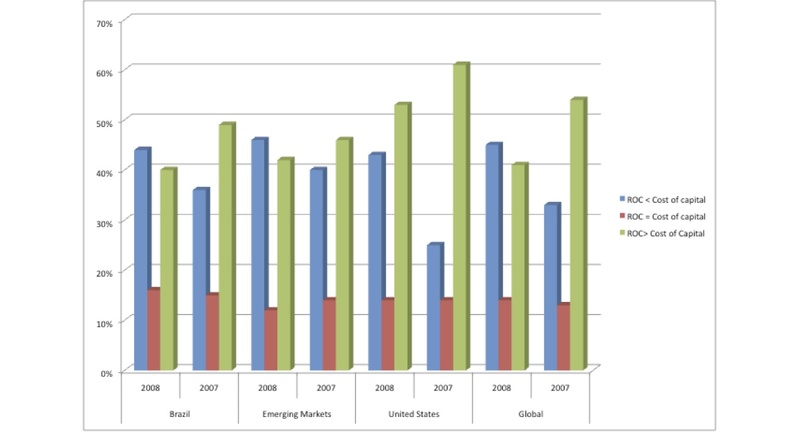 While the crisis in 2008 took at toll on returns, even in 2007, a good year for most companies globally, about a third of all companies in the US and a higher proportion elsewhere generated returns on capital that were less than the cost of capital. While you may quibble with the year and have issues with how I computed cost of capital and return on capital, I think you will agree that value destruction is far more common at companies than we would like to believe and that quality growth (that increases value) is rare. To answer the second question, I compute returns on capital and cost of capital, by sector, for US companies and report them on my website at the start of every year. You can get the most recent update (from the start of 2011) by clicking here. In the last column, I computed the marginal return on capital in that year by dividing the change in operating income that year by the change in capital. Based on this measure, in 2009 and 2010, Google saw a drop off in its quality of growth, a drop off I would attribute to acquisitions made by the company to keep its growth rate high. Its pre-tax marginal return has dropped to about 20%; in after-tax terms that would be closer to 13 or 14%, a good return on capital, but not a great one. Investors have had wake up calls in Amazon and Netflix as well in recent days, as the costs of delivering growth have come to the surface. In most growth companies that disappoint, the clues are available in the years before. As companies get larger, it becomes more difficult to sustain high percentage growth rates in revenues for two reasons. The first is that the same percentage growth rate will require larger and larger absolute changes in revenues each period and thus will be more difficult to deliver. The second is that a company's success will attract the attention of other firms; the resulting competition will act as a damper on growth. I know! I know! You have your counter examples ready: Apple and Google come to mind. First, note that even these exemplars of success have seen growth rates decline over time. In fact, I posted Google's revenue growth (in dollar and percentage terms) in a prior post and while growth rates remain healthy, they have declined over the last decade. Second, the very fact that you can name these great growth companies is an indication that you are talking about the exceptions rather than the rule. Could the company you are looking at right now be the next exceptional company? Sure, but do you want to value your company to be the exception? I would not, since pricing your company for perfection will open you up to mostly negative surprises in the future. Metrick and Yasuda, in their book on venture capital, have a sobering study on the persistence (or lack thereof) of growth at high growth companies. They compared the revenue growth rates at companies at the time of their IPOs to the average for the sector to which they belong and then followed up by looking at these growth rates in subsequent years. 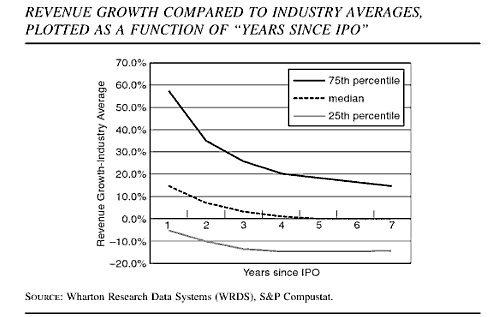 Reading the graph, the revenue growth rate of the "median" IPO company is 15% higher than the revenue growth rate of other companies in the sector one year after the IPO, drops to 8% two years after, to 5% three years after and to the sector growth rate 5 years after. Put succinctly, company-specific growth at the typical high growth company dissipates in about 4 to 5 years. 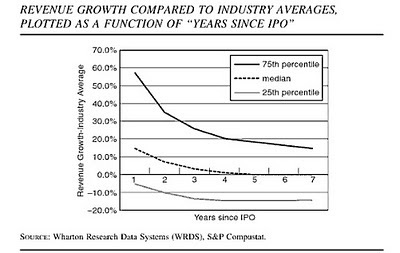 Even the star IPOs (in the 75th percentile) see precipitous drops in the differential growth rate over the five year period. Given this evidence that growth decelerates quickly at companies, how do we explain valuations where analysts use 50% compounded growth rates for 10 to 15 years or longer? I think the problem lies in the "percentage illusion", where analysts feel that their growth assumption is not changing if they keep the growth rate unchanged. However, delivering a 25% growth rate is far easier in year 1 than the same firm delivering a 25% growth rate in year 9. The best way to introduce some realism in growth rates is to convert the percentage growth rate in revenues into dollar changes in revenues and consider what the company will have to do in terms of operations to deliver that change. When valuing a retail company, for instance, computing that the company will have to open 300 new stores to deliver a 25% growth rate in year 10 (as opposed to 30 in year 1) may quickly lead to a reassessment of that growth rate. I have a very simple spreadsheet that does little more than this: convert percentage growth rates into revenue changes each period. As an exercise, take any young, growth company that you want to value, put in the current revenues and try different compounded revenue growth rates. The power of compounding continues to amaze me! When valuing young, growth companies, a key input into the valuation is the expected growth rate in revenues. For these companies to become valuable, small revenues have to become big revenues (and negative operating margins have to become positive ones...) and revenue growth is the driver of value. It is a tough number to estimate and it is easy to get carried away, especially in hot sectors. In this post, I will look at the information that can be used to put limits on this estimate, reasons why some companies may be able to blow through these limits and the disconnect that often emerges between company level estimates (made by analysts) and sector-wide estimates. Let's start with the fundamental question. When valuing an individual company with potential for growth, how high can the revenue growth rate be? Put differently, how big can dollar revenues become at a company, assuming that it is successful? As I noted in the Green Mountain Coffee discussion in my last post, there are at least two numbers that need to be used as sanity checks. The second are the revenues of the largest players in that market. In effect, you are looking for the point at which revenues will plateau in a particular business. Thus, the fact that Folgers, the largest company in the coffee market, made only $2 billion in revenues in 2010 operated as a cautionary note in how much revenues you could project for Green Mountain Coffee. In contrast, Safeway,one of the largest grocery store companies, had revenues of $42 billion in 2010. If you are valuing a company in a sector that you are unfamiliar with, you should get a sense of the revenues generated by the entire sector and how much revenues the largest company or companies in the sector had. To help, I have put together a spreadsheet that lists aggregate revenues, by business, for companies in the US, as well as the highest revenue company in each one. While my business categorization may be too broad for some of you, it should help provide some perspective on what comprises large revenues. In making these estimates, though, you will have to exercise judgment, which can cause your "limits" to be different from mine (and your valuation to be higher or lower than mine). The first judgment is the potential market for the product or service provided by the company. While that may be easy for Green Mountain, what is the potential market it for Groupon or Google? In the case of Groupon, is it a slice of the retail business (which would be huge) or it is a smaller subset? In the case of Google, is it the online advertising market or the entire advertising market or is its something else altogether? The second is the market share that you see your company gaining, if it makes it through to mature firm status. In other words, do you see your company becoming one of the largest companies in the business or remaining a smaller player? Expand product/service offerings: A company can increase its potential market, by altering its product/service mix. Amazon.com, in its early days in the 1990s, was primarily an online book retailer. If it had stayed in that business, the potential market would have been small and Amazon's value would have been constrained. By remaking itself as an online retailer (of pretty much any product), Amazon expanded its potential market (and with it, its value). Expand geographically: While most companies initially target domestic or local markets, the potential market can be increased by expanding geographically. The list of big name companies that have rediscovered growth by going global is long - Coca Cola, McDonald's and Procter and Gamble come to mind. Expand product reach: In perhaps the most interesting scenario, a company can expand the potential market for a product or service through innovations. The secret for Apple's success in the last decade has not only been a stream of winning products - iPod, iPhone and iPad, but each product has expanded what were small markets (music players, smart phones, computer pads) into much larger ones. Can these surprises be incorporated into conventional valuation? By their very nature, I don't think they can, since they are unexpected at the point of initial analysis. (If you invested in Apple at the time of the iPod introduction, foreseeing the iPhone and iPad, you have a far better crystal ball than I do...) However, these "market expansion possibilities" can be viewed as options, where companies use existing platforms to generate new products and enter new markets, and can be valued as such. Even if you choose not go down the road of using option pricing models, these options will translate into a premium on conventional valuations, albeit one that cannot be easily quantified. You would expect this premium to be greatest in companies that have a proprietary edge (Apple, with its ownership of its operating system, is a perfect example...) and smallest when products can be imitated at low cost. As an investor, I tend not to include these "options to expand" premium in my initial valuations. If I can find a stock that is cheap relative to intrinsic value, the option premium is just icing on the cake. From micro to macro... It has to add up..
One final note on growth limits. I believe that investors (and markets) generally get the macro story right but are not always consistent on the micro story. Put in revenue growth terms, optimistic investors are right that the social media businesses collectively will generate high revenues in the future. However, here is where I think that they make their mistake. First, if you add up the expected revenue numbers (that are implicit in the valuations you see for these companies) of the individual companies that comprise the social media space, the collective revenues will significantly exceed the forecasted revenues for the entire market. In other words, your collective market share across companies will be well in excess of 100%. Second, I think that investors are under estimating the ease with which new companies can enter these businesses, under cutting margins and profitability. You can have a growing market where companies have trouble making money. In fact, the dot com boom provides an interesting historical perspective. In hindsight, investors clearly got the macro story right: that consumers would get more and more of their products/services online. It was in the valuation of the individual companies that they made their mistakes, over estimating growth at these companies and under estimating both the ease of entry/exit into the business and the effect of competition on profitability. The first was on Google, with the focus being on how much Google is spending to impressive growth numbers. The second and continuing story is on Groupon and it’s imminent or not so imminent IPO, with the emphasis being on the accounting shenanigans and market whiplash. The third story is on Green Mountain Coffee, an incredible success story over the last five years, and the skepticism that some investors are showing about whether it can sustain its growth. While the stories are on different issues, the questions they raise all revolve around the sustainability of growth at these companies, the price paid to generate the growth and the relationship between growth and value. The feasibility of growth: With growth companies, the debate about how high growth rates can be and how long growth can be sustained falls along predictable lines. The optimists argue for high growth and the pessimists argue that this growth is not feasible and investors are caught in the middle, wondering which side to believe. Ultimately, though, a company’s growth is constrained by the size of the market in which it operates. Green Mountain Coffee, for instance, had revenues of $1.36 billion in 2010, a sizable market share of the processed coffee market. To provide a measure of what is feasible, the overall revenues from coffee sales at supermarkets, drugstores and retailers in the US in 2010 amounted to little more than $ 5 billion; Folger's is the largest of the grocery store coffee producers has revenues of about $ 2 billion. While this total revenue does not count revenues from products like Keurig, it leads me to believe that Green Mountain Coffee is not a "small" company in this market. It is always possible that Green Mountain could expand its product line but what are its choices? Green Mountain maple syrup comes to mind, but that is a tiny market; Green Mountain chocolates may work, but the premium chocolate brands carry Swiss or Belgian imprimaturs. It is also possible that Green Mountain could increase the overall size of the market by convincing tea and soda drinkers to switch to gourmet coffees... but I think that is unlikely to happen. Scaling Growth: As companies get larger, their growth rates will decline. That is indisputable, though great growth companies may be able to slow the decline and extend it over longer periods. Google, for instance, has been more successful than most growth companies in the last decade in sustaining high growth for an extended period, but even it has found that it is far more difficult to post high growth rates in revenues as its gets bigger. In the figure below, I graph out the percentage change in revenues and the dollar change in revenues each year at Google from 2001-2010. While the $ change in revenues has increased over time, the percentage change in revenues has decreased every year (except 2009). 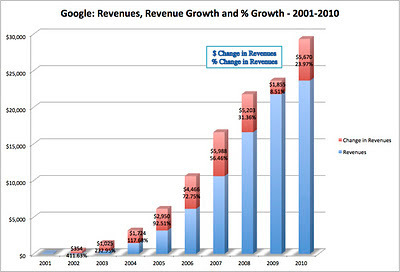 And consider this: Google is one of the most successful growth companies of the last decade. Growth and Value: While many analysts view higher growth as good for value, it is clearly not that simple. After all, going for higher growth requires companies to make a trade off. On the one side, there is the good stuff: higher growth boosts revenues and earnings. On the other side, there is the bad stuff: growth is not free. Companies have to invest to generate sustainable growth: those investments can be in long term assets (factories if you are a manufacturing firm, R&D if you are a technology or a pharmaceutical firm, recruiting & training if you are a consulting firm), short term assets (inventory or accounts receivable) or acquisitions of other companies. All of these investments reduce cash flows. The net effect can therefore be positive or negative and is captured by looking at whether the firm generates a return on its investments (return on invested capital or return on equity) that exceeds its cost of funding (cost of capital or cost of equity). In the case of Google, the price of growth has risen over time, as the company seems to be caught in a cycle of making acquisitions that get larger each year, to post the same growth rates. With Groupon, this debate has morphed into an accounting question. Even if we accept the company’s argument that customer acquisition costs should be capitalized (see my earlier post on the issue), the question that follows is a simple one. How much value is added by a new customer? (To answer this question, the company will have to provide more information on customer behavior.) More critically, is it becoming less positive over time as the company gets bigger and goes after more elusive customers, in the face of increased competition from Amazon and LivingSocial? Unfortunately, the firm is providing little information on these key questions. Growth and Credibility: My favorite framework for thinking about businesses is a financial balance sheet. Within this framework, here is the key difference between mature and growth companies. The former derive most of their value from assets in place, whereas the latter get the bulk of their value from growth assets. Since the value of growth assets rests entirely on perceptions and expectations about the future, it also rides on the credibility of management. In other words, you need to believe managers when they tell you their plans for the future and you expect them to be disciplined in following through. If managers are not credible and disciplined, the value of growth assets can very quickly melt away. That is the lesson that Groupon and its investment bankers do not seem to get. As a potential investor in Groupon, I am not valuing it based on how much money it made or lost last year but on my expectations about its future. All the accounting moves made by Groupon over the last year seem to be centered around making their numbers (revenues, earnings etc.) from last year look better. Even if they succeed in this endeavor, all they will do with these actions is change the value of their existing assets marginally. In the process, though, they have damaged the trust that investors have in them and put the value of their growth assets at risk. When 90% or more of your value comes from growth assets, that is just dumb. Each of these issues deserves a full post and I will make a series of posts in the next few days on each one. In the meantime, these companies will continue to entertain us for the next few months. Let's face it! Growth companies are a lot more fun to assess than mature companies.